1997 Mori Seiki SH-50 2-Pallet 4-Axis CNC Horizontal Machining Center s/n 606 w/ Mori Seiki MSC-516 Controls, 42-Station ATC, CAT-40 Taper Spindle, Hand Wheel, Chip Conveyor, Chip Augers, High Flow Coolant, (2)19 ½” x 19 ½” Pallets. Kao-Ming / Amura KMC-1800 Bridge Style CNC Vertical Machining Center s/n 752192 w/ Fanuc 11M Controls, 24-Station ATC, CAT-50 Taper Spindle, 2500 RPM, Chip Auger, Chip Conveyor, 34” x 71” Table. Kasuga “Quantum” Q-NC3H-43 3-Spindle CNC Vertical Machining Center s/n Q9120236 w/Fanuc Controls, BT-40 Spindles, 7500 RPM. Kitamura Mycenter-4 CNC Vertical Machining Center s/n 30612 w/ Fanuc 0-M Controls, 30-Station ATC, 40-Taper Spindle, Chip Conveyor, 22 ½” x 55 ¼” Table, Coolant. Kitamura Mycenter-2X CNC Vertical Machining Center s/n 02670 w/ Yasnac Controls, 20-Station ATC, CAT-40 Taper Spindle, 14” x 31” Table. Kitamura Mycenter-1 CNC Vertical Machining Center s/n 02809 w/ Fanuc 0-M Controls, 20-Station ATC, 40-Taper Spindle, 14” x 31” Table. Tongil TNV-80 CNC Vertical Machining Center s/n 1K0510045511 w/ Fanuc Series 0-M Controls, 30-Station ATC, BT-40 Taper Spindle, 45-4500 RPM, 13 ¾” x 47” Table. 1994 Supermax MAX-1 Rebel CNC Vertical Machining Center s/n 412064 w/ Mitsubishi Controls, 16-Station ATC, CAT-40 Taper Spindle, Hand Wheel, 16 ½” x 33” Table. 1990 Cincinnati CL-5 CNC Laser Center s/n 46440 w/ Fanuc Series 0-M Controls, Rofin-Sinar Laser Controls, 1996 Rofin-Sinar 1350SM 2300 Watt Laser, Koolant Koolers Cooling Unit, (2)4’ x 4’ Tables (NEEDS WORK). Rofin-Sinar 700SM 800 Watt Laser, Koolant Koolers Cooling Unit, (2)4’ x 4’ Tables (NEEDS WORK). 2004 Annn Yang mdl. DY1500X9000G Geared Head Gap Bed Lathe s/n MTD-15-011G w/ 3-400 RPM, 50Hp Motor, Inch/mm Threading, Tailstock, (2)Steady and (2)Follow Rests, Power Feeds, 50” 4-Jaw Chuck. TB 26” x 144” Geared Head Gap Bed Lathe s/n 8579 w/ Taper Attachment, Inch Threading, Tailstock, Steady Rest, 24” 4-Jaw Chuck. Lodge & Shipley 27” x 104” Lathe w/ 11-450 RPM, Taper Attachment, Inch Threading, Tailstock, Steady Rest24” 4-Jaw Chuck. Lodge & Shipley AVS2013 Lathe s/n 50796 w/ 34-2000 RPM, Taper Attachment, Inch/mm Threading, Tailstock, Steady Rest, 12” 4-Jaw Chuck. Unknown mdl. 2280G 22” x 80” Geared Head Gap Bed Lathe s/n 867518 w/ 25-1500 RPM, Inch Threading, Tailstock, Steady Rest, 12” 3-Jaw Chuck. LeBlond 15 ½” x 60” Lathe w/ 45-1800 RPM, Inch/mm Threading, Tailstock, 12” 3-Jaw Chuck. Mori Seiki ML-850 16” x 36” Geared Head Gap Bed Lathe s/n 3376 w/ 77-1834 RPM, Inch/mm Threading, Tailstock, KDK Tool Post, 8” 3-Jaw Chuck. Poncho mdl. TY-36 11” x 36” Bench Model Lathe s/n 871 Bullard 36” Vertical Turret Lathe w/ Facing/Turning Head 34” 4-Jaw Chuck. DiAcro Hydra-Press 14-72 72” x 14GA Hydraulic Press Brake s/n 6600378373 w/ 9” Throat. Doelger & Kirsten mdl. 25-3 54” Press Brake s/n 170 w/ 9” Throat. PHI mdl. 210HRLCJ10 Hydraulic Tube Bender s/n 968-001 w/ PHI Controls. (2)Klockner-Moeller 42-Ton 4-Post Hydraulic Presses. Federal 50 Ton OGI Stamping Press s/n 5-1520 w/ 7” Stroke. Rousselle No. 3G OBI Stamping Press s/n DGS10437. Kenco mdl. 8-101 8 Ton OBI Stamping Press. Kenco mdl. 5A-1 5 Ton Stamping Press. Pexto mdl. 381-D 36” x 22GA Slip Roll s/n 9/68 w/ Stand. 36” Custom Power Slip Roll. May Tool mdl. MTC-42 42” Power Circle Shear s/n 0138. Ameritech mdl. SM-6012 60” Beading Machine s/n 2100SM0401. Torrington Torsion Spring Winder s/n 88757-TM W-3001 w/ 1” Max Spring Dia, 20-120 Springs/Min. Whitney Jenson NF420 48” Finger Brake s/n 1106-1169. Inch/mm Threading, Tailstock, (2)Steady and (2)Follow Rests, Power Feeds, 50” 4-Jaw Chuck. Steady Rest, 12” 4-Jaw Chuck. Steady Rest, 12” 3-Jaw Chuck. Pratt & Whitney 4th Axis 42” Rotary Table. Lathe Chucks to 36” Dia. Press Brake Tooling w/ Rack. Delta Design RFS Handler System. (2)Netzsch mdl. D-8672 Horizontal Media Mills s/n’s 204743, 204467. Netzsch mdl. LME-50 Horizontal Media Mill s/n 207-083. Netzsch mdl. LMJ-1/LME-2 Horizontal Media Mill s/n 204-776. Netzsch mdl. LMC-60(E) Horizontal Media Mill s/n 201-786. Netzsch mdl. 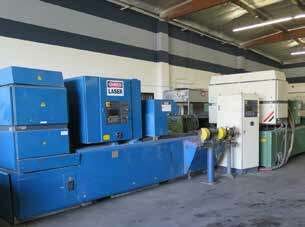 LMC-60-E Horizontal Media Mill s/n 201-783. 2001 Shell-O-Matic mdl. 4000AC Sand Loader s/n 2391-2 w/ (2)36” Storage Tanks, (3)36” Mixing Tanks. Videojet “Excel 2000” Inkjet Marking System. Aquafine mdl. RBE-8R Ultraviolet Disinfection System s/n KS97009. Aquafine / Ionics mdl. SL-1 Purification System s/n FS04487. ESC Sharplan / IPL Quantum mdl. SA3501000 Laser Treatment Devise (Medical). 2004 Steager mdl. K80/16-72/98 Automated Braider s/n 5647. (3)Kulicke & Soffa mdl. 8060 Automated Wedge Bonding Machines. (6) Ruiz Food Equip. Tortilla Extruders. Food and Beverage Dispensing Machine w/ Manuals and Keys. Bridgeport Series 2 Vertical Mill w/ 50-3500 RPM, 40-Taper Spindle, Box Ways, Power Feds, 11”x 58” Table. Bridgeport Series 1 – 2Hp Vertical Mill s/n 193246 w/ Mitutoyo DRO, 1.5Hp Motor, Chrome Ways, Power Feed, 9” x 42” Table. Bridgeport Vertical Mill s/n 134700 w/ 1Hp Motor, 80-272- RPM, 10” Riser, 9” x 42” Table. Chevalier mdl. FM-32HP CNC Vertical Mill (NO CONTROLS) w/ 50-3750 RPM, 10” x 50” Table. Deckel mdl. FP2 Universal Mill s/n 5526 w/ Mitutoyo DRO, 40-2000 RPM, Dividing Table, Shaping Attachment, 11 ¼” x 27 ½” Table. Moore No.3 Jig Boring Machine s/n G248 w/ Pneumatic Grinding Head, Power Feeds, 11” x 24” Table. Scotchman mdl. 12012 120 Ton Ironworker s/n 50633M898 w/ 1” thru ½” Punch Cap, Flat Shear 1” x 12”, ¾” x 16”, 5/8” x 18”, ½” x 24”, Angle Shear 6” x 6” x ½”, Round Shear 1 ¼”, Square Shear 1” x 1”, 90 Degree Notcher 6” x 6” x ½”, Coping Notcher 2” x 2 ½” x 3/8”, 24” Press Brake. Piranha II 60 Ton Ironworker s/n 071 w/ 1” thru ¾” Punch Cap, Flat Shear ¾” x 8”, 5/8” x 12”, ¼” x 24”, Angle Shear 5” x 5” x 3/8”, Round/Square Shear 1 ½” R, 1” x 1” Sq, Coping Notcher 2 ¾” x 4” x ¼”. Geka Hydracrop mdl. 55/S 55 Ton Ironworker w/ Punch, 12” Flat Shear, 5” x 5” Angle Shear, 1” Bar Shear, 1 ¾” x 3 ¾” Coping Notcher. Piranha mdl. P50 50 Ton Ironworker w/ 1 1/16” thru ½” and 13/16” thru ¾” Punch Cap, Flat Shear 1” x 4”, ¾” x 10”, 5/8” x 15”, Angle Shear 5” x 5” x 3/8”, 1 ½” Round Bar Shear, 1” x 1” Square Bar Shear, Coping Notcher 2 ¾” x 4” x ¼”. Uni-Hydro mdl. 42-14 42 Ton Ironworker s/n 3P1011 w/ Flat Shear 3/8” x 14”, ½” x 10”, 5/8” x 6”, Angle Shear 3” x 3” x 5/16”. Turret, Hydraulic Tailstock, 15” 3-Jaw Chuck, Chip Conveyor. Front and Rear Machining, S20 Main Spindle Nose, S16 Sub Spindle Nose. Miyano BNC-20S Twin Spindle CNC Turning Center s/n BN20213S w/ Fanuc Series 0-T Controls, 6-Station Turret, Front and Rear Machining, 6000 RPM, Parts Catcher and Conveyor, Chip Conveyor. Front and Rear Machining, 6000 RPM, Parts Catcher and Conveyor. Turret, 25-2500 RPM, 40Hp Motor, 15” 3-Jaw Chuck. 1993 Cincinnati CL-5 CNC Laser Center s/n 48095 w/ Fanuc Series 0-M Controls, Rofin-Sinar Laser Controls, ofin-Sinar SM 2300 Watt Laser, Koolant Koolers Cooling Unit, (2) 4’ x 4’ Tables (NEEDS WORK). 1991 Cincinnati CL-5 CNC Laser Center s/n 47344 w/ Fanuc Series 0-M Controls, Rofin-Sinar Laser Controls, 1000 Watt Laser CO2, Koolant Koolers Cooling Unit, (2)4’ x 4’ Tables (NEEDS WORK). Mitsubishi DWC90CR CNC Wire EDM Machine w/ Mitsubishi Controls, 10 ½” x 12 ½” Work Area, 16 ½” x 20” Fixture Area, Coolant Filtration System. Acme mdl. M17106 2 ½” Auto Threading Machine w/ 26-132 RPM. Finn-Power mdl. NC-20 Hydraulic Hose Crimping Machine. MBA Media Blast & Abrasive mdl. 4836 “Tube Blaster” s/n 2574200 w/ 2 ¾” Thru Cap, Feed System, (10) Blasting Heads, Dust Collector. Natco Multi Spindle Power Drill s/n D225H-987 w/ 20-Spindles, 23” x 25” Table. Sullair mdl. 10B-25ACAC 10Hp Screw Type Air Compressor w/ 120 Gallon Tank. Binks 5Hp Vertical Air Compressor w/ 60 Gallon Tank. Jen-Ken AF Crucible 2418 Double Wall Electric Kiln. Jen-Ken Crucible 24 Double Wall Electric Kiln. CTD mdl. M225 Pneumatic Cutoff Saw s/n 887 Saw Stop Table Saw w/ Fence. Ampak “Shipmate II” mdl. SG-1824-A 18” x 24” Vacuum Heat Sealing Machine s/n 86. (3)30” Cap Heated Rotary Parts Washers. Insta-Pak Foam Fill Packaging Machine. Thermotron mdl. F-112-CHV-30-30-ECA Chiller s/n 17786. Duro Dyne 60” Glue Spreading Roll. Grieve mdl. HA-850 850 Degree Electric Oven. (4)Therma-Stor mdl. HI-E Dry 195 High Efficiency Dehumidifiers. Torit mdl. 64 Dust Collector. (2)Sim-Test mdl. QT150DZR Engine Test Stations s/n 89101. Storm Vulcan mdl. 15C 18” x 75” Cam-Crank Shaft Grinder s/n 15C-57-116. Storm Vulcan mdl. 15 18” x 75” Cam-Crank Shaft Grinder s/n 194-71R. Van Norman mdl. 475 Crank Shaft Regrinder s/n 4245-878 w/ Approx 18” x 56” Cap. Van Norman mdl. 475TA Crank Shaft Regrinder s/n 5114-269 w/ Approx 18” x 48” Cap. Rottler mdl. FA2MACB Cylinder Boring Machine. Rottler mdl. FA2MA Cylinder Boring Machine. Sunnen LBB-1810 Precision Honing Machine s/n 21788 w/ Power Stroke and Hone Gage. Sunnen LBB-1810 Precision Honing Machine s/n 23771 (NEEDS WORK). Auto Repair Parts Including Filters, Hoses and Belts. 2001 Shell-O-Matic mdl. 4000AC Sand Loader s/n 2391-2 w/(2)36” Storage Tanks, (3)36” Mixing Tanks.